Following his investigations in The Holy Thief, which implicated those at the very top of authority in Soviet Russia, Captain Alexei Korolev finds himself decorated and hailed as an example to all Soviet workers. But Korolev is uneasy– his new-found knowledge is dangerous, and if some of his actions during the case come to light, he will face deportation to the frozen camps of the far north. But when the knock on the door comes, in the dead of night, it is not Siberia Korolev is destined for. Instead, Colonel Rodinov of the NKVD asks the detective to look into the suspected suicide of a young woman: Maria Lenskaya, a model citizen. Korolev is unnerved to learn that Lenskaya was in a relationship with Ezhov, the feared Commissar for State Security and that Ezhov himself wants to matter looked into. And when the detective arrives on the set for Bloody Meadow, in the bleak, famine-scarred Ukraine, he soon discovers that there is more to Lenskaya’s death than meets the eye . . .
Shortlisted for the Irish Crime Novel of the Year. The Holy Thief, set in Stalin’s Russia, was one of last year’s most impressive crime fiction debuts. The Bloody Meadow, William Ryan’s follow-up, does not disappoint … Ryan has obviously done much research into that sinister period of Russian history and manages to convey its claustrophobic atmosphere brilliantly. Ryan has produced a film-noir-ish rewrite of the old-fashioned locked-room mystery, complete with creepily gripping, and ultimately gruesome, cops and robbers chase through the great catacombs on which Odessa sit … Ryan’s unrolling of the mental gymnastics required to survive this upside-down world where the morning’s hero is the evening’s victim is both thrillerishly pacey while also allowing his characters to grow in moral stature. Some authors and publishers live in fear of their second book. The dread springs from the readers’ familiar refrain: “That first book was so good… what went wrong?” Nobody will be asking that question about The Bloody Meadow, every bit as darkly compelling as its predecessor with all the elements that made The Holy Thief so successful: razor-sharp plotting, an evocative sense of location in a vividly realised Ukraine and most winning of all the vulnerably human Alexei Korolev making a nuisance of himself. William Ryan’s much-admired debut, The Holy Thief, centred on 1930s Russian detective Alexei Korolev. The Follow up The Bloody Meadow sees Korolev sent to investigate the murder of a commissar’s mistress during a film shoot on a Ukrainian estate. The resemblance to an Agatha Christie country house mystery (but with an injection of politics) grows as he quizzes a colourful set of suspects, in a novel that confirms Ryan’s talent but lacks The Holy Thief’s impact – since the atmosphere of Moscow amid Stalin’s Terror was crucial to its grip on the reader. It’s an outstanding thriller … admirers of Ryan’s troubled and wary hero will hope that he reappears for yet another outing. Filled with chilling twists and turns, The Bloody Meadow is another masterpiece from Ryan, whose first book, The Holy Thief, is also set in 1930s Russia. Though mysteries set in this period abound, The Bloody Meadow holds its own. Ryan spins a gripping tale to illuminate the burning issues of the day: cheap labour brought in from villages to work in factories and living in squalid conditions, the plight of children in orphanages, the widening gap between the “haves” and “have-nots”, and arbitrary arrests for sabotage … The history of Russia is beautifully captured, including the Civil War and atrocities committed by the NKVD in the name of quashing counter-revolutionaries. 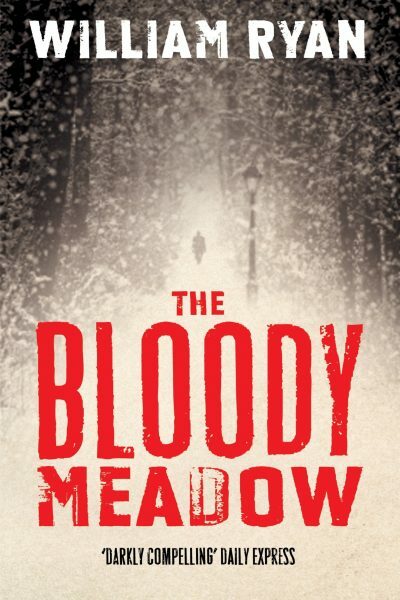 For an Irish writer to capture the pulse of the Soviet empire like a Muscovite is commendable and testament to the extensive research Ryan conducted … With its pacy style, The Bloody Meadow is a high-speed thriller that keeps you turning pages until the end. I could have read the 308-pager in one sitting had it not been for the Russian names that I had a hard time remembering. However, the list of key characters and their roles that the author has thoughtfully provided at the beginning of the book proved helpful. The Bloody Meadow is a well-crafted story with believable characters. Ryan is very knowledgeable about a dreadful place during a terrible period of history, and creates an atmosphere of claustrophobia and terror. In a topsy-turvy world where logic and experience can’t compete against a capricious tyranny, Korolev knows only too well that survival is a fluke and safety is an illusion. This is very neatly plotted and well written, and amounts to a convincing recreation of paranoia in Stalinist Russia. A fine successor to last year’s The Holy Thief ..the new thriller finds the decent, cautious, Korolev investigating an apparent suicide at a film location in the Ukraine of the 1930s, but in a Soviet Union marked by purges and paranoia, all is not as it seems. Ryan handles his plot and characters in an admirably unfussy and engrossing manner. [THE Bloody Meadow] joins a long line of Soviet-based mystery series. The door to this genre was firmly opened by Martin Cruz Smith’s Arkady Renko series, which kicked off with the classic GORKY PARK, and most recently the Russian thrillers of Tom Rob Smith. I believe Captain Korolev has much more to say, and I look forward to his next outing. Ryan’s prodigious research is crafted into an intense tale marked by Korolev’s yearning to do an honest job of criminal investigation without drawing attention to his essentially ethical and religious nature (a no-no in the atheistic Soviet Union). Ryan’s main characters are strong and believable, the dialog is crisply idiomatic, and Odessa’s cityscape is grimly foreboding. Ryan’s Korolev is on a brilliant trajectory to join the ranks of respected European detectives. … Booklist lauded Ryan’s first Korolev novel, The Holy Thief (2010), and this successor fully delivers on the promise of that judgment. Korolev is a wonderful character, a spiritual ancestor of Martin Cruz Smith’s Arkady Renko, persevering amid the murderous paranoia of Stalin’s Russia. The plot is intricate, the action satisfying, and Ryan’s use of period detail, including the brutal collectivization of the Ukraine and that region’s nationalist and anarchist movements, makes for exhilarating reading.